We believe that innovation and success are borne out of great relationships and working together in an open, honest and transparent manner. We hope that by sharing our news we will develop and grow our relationship with you and offer added value by sharing our experience and learning. Our news is of our people, our high-profile projects and our professional affiliations. We would also love to interact with you through our facebook pages and twitter. We are particularly proud of the images of our projects, we hope you enjoy them too. The Abbey Green site is undergoing a major restoration project, including enhancements to the watercourses. The environmental improvements will be of great benefit to both the public and the natural ecology at the site which links into the River Anker. 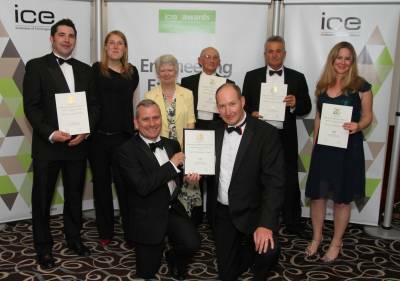 The company won the prestigious Institution of Civil Engineers (ICE) Environmental and Sustainability Award 2013 for its work on the restoration of Fleet Pond in Hampshire - a SSSI and local nature reserve. The success of this project was helped by positive engagement with stakeholders and suppliers. Our Director, Damian McGettrick, took part in a plaque unveiling ceremony at the famous M6 ‘Spaghetti Junction’ at Gravelly Hill, Birmingham on 13 December. The event was to commemorate 40 years of this iconic structure and to raise the profile of Civil Engineering. The current ICE West Midlands Chairman and Director of the Highways Agency, Tim Harbot formally unveiled the plaque and was joined by the ICE Municipal Expert Panel, a national group advising on infrastructure in the UK. WM Longreach have returned to this historic park in Worcestershire to carry out some vegetation clearance works from the watercourse. Using a very specialist ‘walking’ excavator, the machine worked from within the river to minimise disturbance to the adjacent landscape. Over a thousand metres of riverbank was cleared with the vegetation and silt deposited and profiled into the surrounding area. This essential maintenance work will keep the historic water courses in their full glory for the benefit of the visiting public and flourishing wildlife. 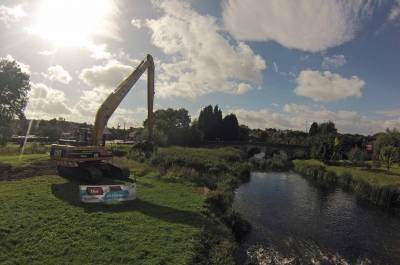 Using a long reach excavator with low ground pressure tracks and a hydraulic weed cutting bucket, the Company is carrying out river clearance works for the Shropshire Wildlife Trust. Essential maintenance on over 2500 metres of river is to be completed this month. The next phase of lake restoration work has commenced at Fleet Pond. This will continue the dredging from the earlier phase this year and construct more lake islands to improve the water quality and enhance the habitat for wildlife and ecology. Using our specialist long reach machines on floating pontoons, the island construction is well underway and due for completion in November. We have had an amazing start to the summer with winning the Ground Engineering (GE) Award on 4 May. We then were Highly Commended at the annual Institution Of Civil Engineers (ICE) awards. View our 'Awards' section to see details of our Award winning projects. Mobilisation of the floating plant and equipment to Fleet Pond was carried out in February 2012 using a large crane lift from the Station car park due to the access restrictions. Modular pontoons were assembled that would carry the long reach excavators for the dredging and lake island construction works. A large audience had gathered as this marked a significant milestone for the Pond, in particular the hard work of the Fleet Pond Society, so the success of this day was really welcome.